Its recycle day and the wheelie bin needs collecting, but with the right recycling truck there's plenty of fun in the process while learning about the environment. The ownership of a toy recycling truck means plenty of learning, with education needed on the importance of recycling glass, paper and plastic - before its turned back into packaging at the recycling plant - the truck heads back after a hard day of collecting. 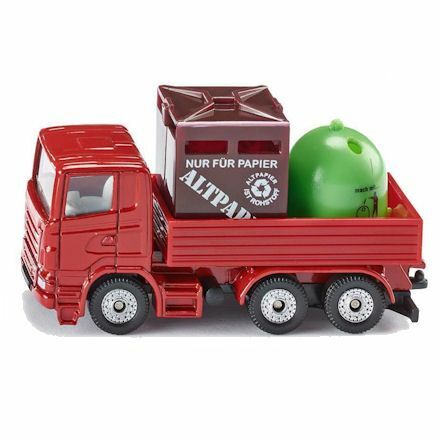 Try not to confuse recycling trucks with bin lorry toys available, well both models are designed to do the same thing, recycling lorries are greener - so to speak. Look out for a functioning part on the truck for tipping the wheelie bins into the truck from the side, and back with free rolling wheels. And you'll find different brands offer a good range of accessories and add-ons like extra wheelie bins and lights and sound options. 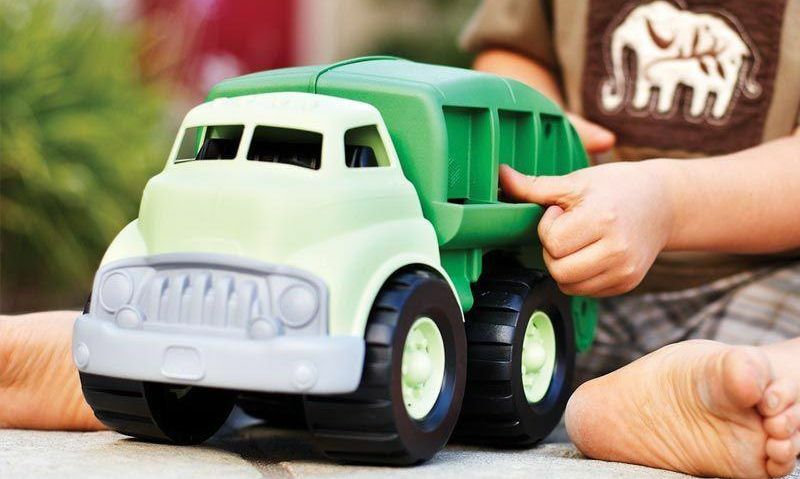 Fill up your toy wheelie bins and the big storage compartment of the truck using small scrunched up pieces of paper that will work best when made into tiny balls to pass through any working mechanics. Try to stay away from pereashables such as uncooked rice and pasta as they make a mess. Also stay away from ink filled paper lik newspapers as the ink will stein. In compiling our list we've taken in consideration all styles of toys with the age group starting from age 1 up to 5 years. One of the best sellers, this Bruder MAN garbage truck has a functional loading arm on the side that fits on the wheelie bins and dumps the recycling into the smaller section. Then with use of a winding up switch, load the refuse into the big main compartment before tipping up the whole back to empty the container. 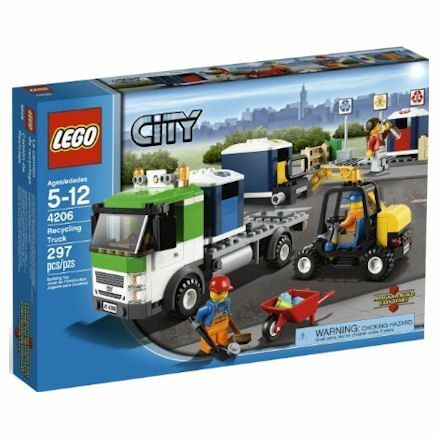 Lego make anything imaginable, and they haven't disappointed with this now 'retired' Lego City Recycling Truck with lots of accessories included in the set. This includes 297 pieces in total making up the recycling truck (pictured) 3 figures, a wheelbarrow, forklift and 3 colour coordinated commercial recycling bins. Yay, a recycling truck boosting a unique method of collecting bins instead of the usual way. 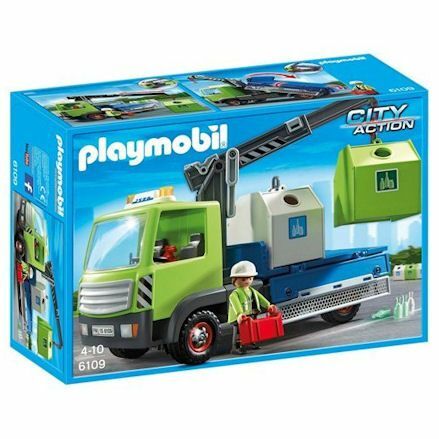 This Playmobil Glass Sorting Truck is available in their 'City Action' range and certainly is among the best they got. This is thanks to a big telescopic arm that reaches out to pick up and lift 2 bottle banks onto the flat bed of the truck. You'll get the truck, 2 bins, 1 figure, glass bottles and more. 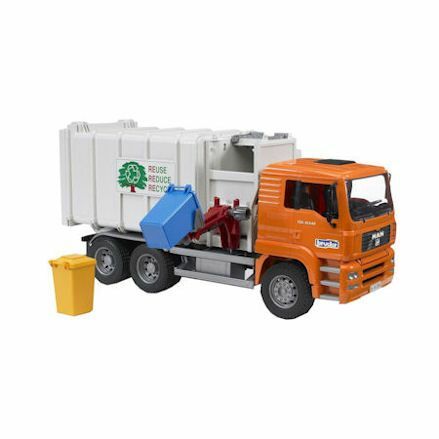 This dinky little Siku Recycling Truck is small in size, but packs plenty of enjoyment. It fits in nicely with your Matchbox cars and similar vehicles in 1:87 to 1:72 scale. Its a simple open back lorry where two brown and green commercial size bins are stored and carried away. When lorry is not in use, drive it around the building site. 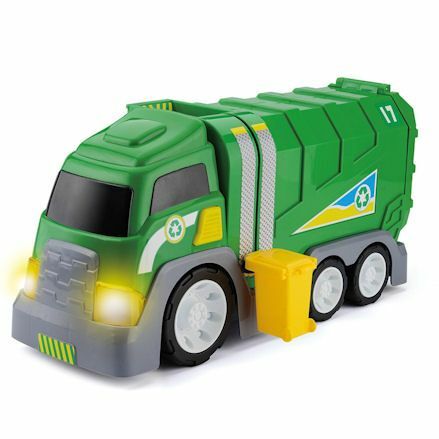 Not the most common looking truck, but this Toyrific Road Roller Recycling Truck comes in a very nice, sleek design. As you'll expect it still works the same as most clip- on wheelie bin to the side-function and it will lift the bin up and all away around to the top to empty the bin. Then open the big door at the back to empty the refuse. 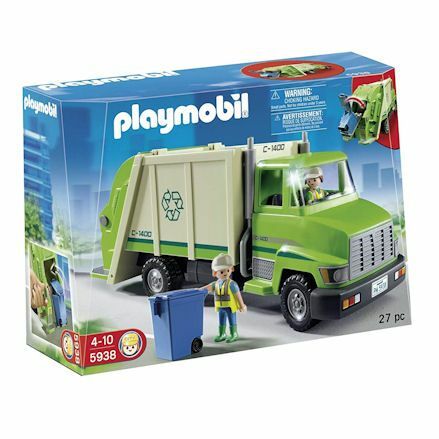 This Playmobil Recycling Truck is one of many trucks available. But in the box is two figures - male and female - one blue wheelie bin, cans for recycling, and of course the green recycle lorry where you can sit them in the removable drivers cabin. To spill your recycling out of the bin and into the back of the truck, simply clip the bin to the slot and lift the lever to tip in the refuse. 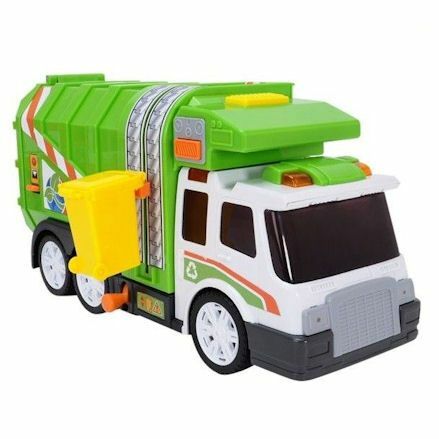 With Dickie Toys Garbage Truck it follows the usual principle by simply placing the wheelie bin on the side slot, using the lever to lift the bin up and over the top to empty it. It then spills into the bigger section where you remove the refuse from the rear door. Most noticeable feature is the lights and sound effects, with batteries included to get you going right out of the box. 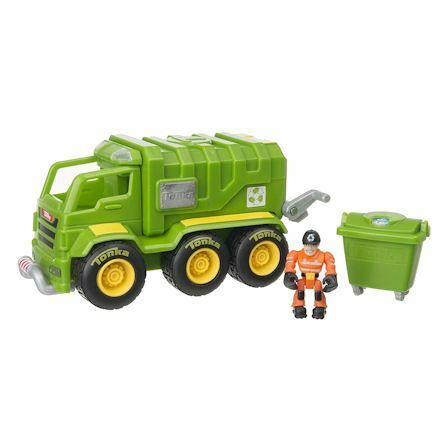 Thanks to its chunky look and smooth corners, one might assume this Tonka Recycle Truck is aimed at a much younger audience, but it's actually aimed at 3 years. This truck comes with a figure for collecting the bins - and with lights and sounds - people will hear you coming up the street and a warning to get the bins. 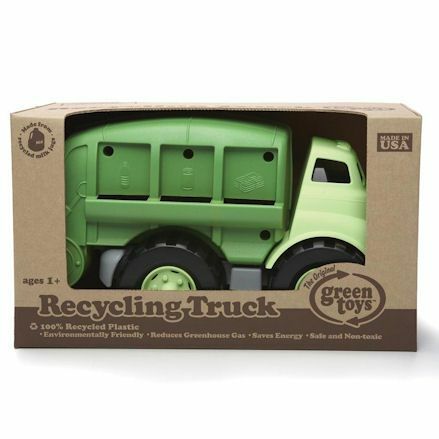 A remarkable, made in the USA plastic Green Toys Recycling Truck actually produced from 100% recycled milk jugs - making this an eco-friendly toy used to replicate recycling. Its a scoot along truck with an opening rear door and a tipping container to empty the contents. And well it's targeted at 3 years, it's highly suitable for kids 12 months and up. Lovely wooden truck for encouraging kids to pick up the refuse on recycling day. 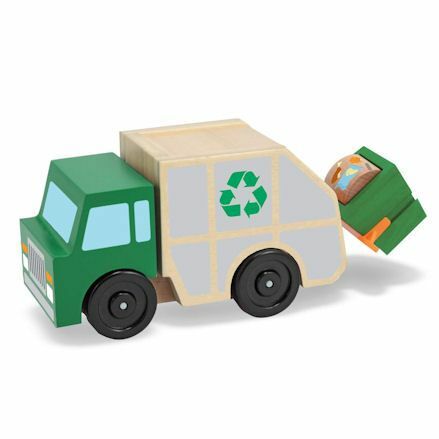 This Melissa & Doug Rubbish Truck has a solid wood chasis, rolling wheels and a functioning fork for lifting the bin into the back of the container. This hand operated truck is perfect for parents with a love for wooden toys as this one ticks the box.